This trip offers you the chance to trek the fabulous Inca Trail in a small group. 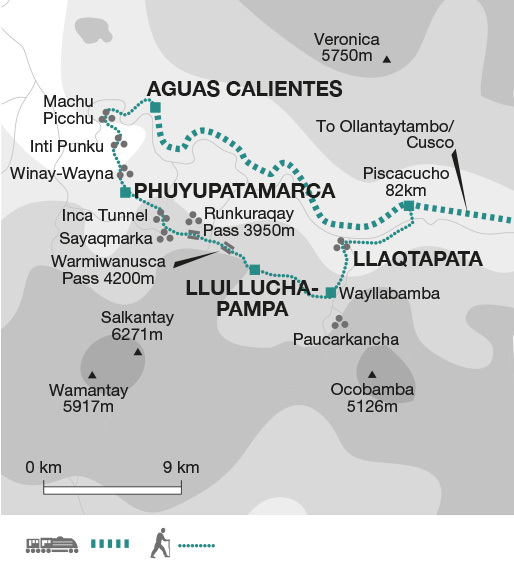 In recent years there have been increasing regulations on the Trail aimed at preserving this fragile, world renowned Heritage Site, and we are pleased to state that we comfortably fit into these regulations and are actively involved in several initiatives which support the communities with which we work in Peru. On the trek we use look at our impacts at every level - from using eco-friendly toilets and biodegradable soap to establishing a relationship with the community of our porters. Aside from ensuring a fair deal for our local team of porters, we work closely with Inca Porter Project in Cusco who are involved in educational projects for people of this remote region. We work with the villages of Misminay and Anccoto where the porters are based to support the families, including vaccination campaigns and have helped to fund a nursery school and community hall (we can sometimes arrange a visit during our spare time in Cusco). We also purchase the vegetables that they farm, offering them an additional source of revenue and allowing you the chance to taste locally produced food. Local operators run our optional excursions, ensuring that the money goes directly to the supplier and the community. The tour is led by a local tour leader who is also the trek guide on the trail. The trek guide is supported by the assistant trek guide and our great team of porters and we abide by the strict Inca Trail guidelines that regulate their working conditions, the care of the Trail and the surrounding communities. We stay in locally owned hotels in Cusco, ensuring that more of your money goes into the local economy.